Paul in this section of the letter to the community in Rome addresses that there is nothing in heaven or on earth that could separate God from us. God cannot fail us but is it possible for us to fail God? We do have trials in our life, things that challenge us and can take us toward giving up or strengthen ourselves. Is there any of these challenges that could separate us from God? 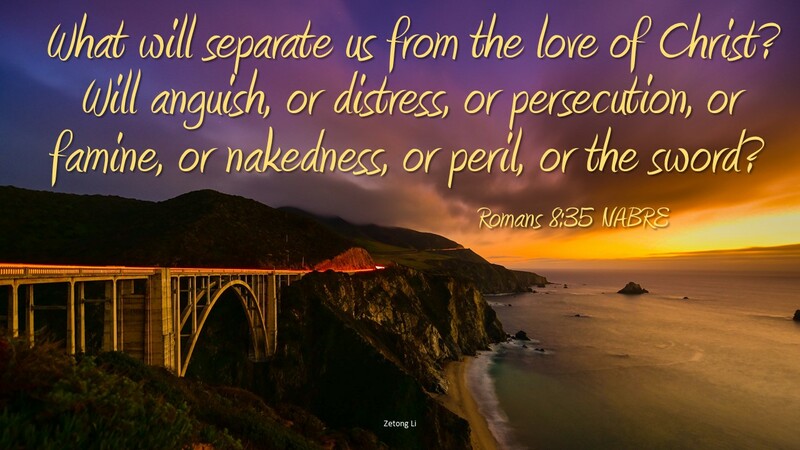 Paul indicates there is nothing that separates us from the love of God. God doesn’t shelter us from difficulties in life because they are used for our spiritual growth. In this section we read that popular line, “If God is for us, who can be against us?” (Romans 8:31) So in time of difficulties God, who is infinitely good, seeks our well-being. The creator of the universe is with us even in trials and no matter the outcome, no matter how we feel we did, God does not desert us. In these trials, God gives us the power to defeat whatever the world is using to try and make us stumble. These trials could never separate us from God, we should trust it, believe it and live it, assured of a victory which God has already acquired for us. I heard of an old monk, who lived a long good life but ended up in blindness. He couldn’t do the things he wanted to do, and in fact became a bit of a burden on the other monks. But all took his blindness as a gift. He said, “I often thank God that he let me be blind. I am sure the he let this happen for the good of my soul.” We may struggle, we may have what most would consider disaster, but with God we should always be joyful and yes thankful. Is there some trial in your life that has you off course? Can you get a joyful attitude in trials like the monk?